Jebel Hafeet - "it was amazing to hear the Azhan from the top of the mountain." My name is Cheryl Jones-Allie. Lately, as I reflect on my life, I have asked with sincerity, “Father, why am I here on Earth?” Some days I ask, “What would you like me to do?” “Am I working according to Your will?” After trekking on my soul’s path, the answers to my questions are being countered with my steadfast conviction. It took a long time to start this journey. I am still trekking on it. In recent days, I feel the answers to my questions. It feels like peace and joy. I always believed I was here to give of my body and my soul to others until I became overwhelmingly tired. I was raised to believe that thinking of me first is very selfish and not pleasing in God’s eyes. So I made sure to add label after label to the bones in my spine, and made sure I excelled at each name for the super woman cape. For all of my life, I have always been so many names to so many people—I am a mother, wife, niece, daughter, cousin, sister, aunt, teacher, author, new business owner, and friend. The one title I never thought I would have to add, yet I am so blessed with to enhance my other roles daily, is Survivor. That title is one I am so thankful for, and I sometimes find myself in disbelief that it describes me. My journey is a tale that will teach one to believe, have faith, and most of all, listen to God’s whispers. I have always had faith in God and believed in His grace for us. I prayed a lot. But in the last nine years, my faith was made stronger in some of the most bizarre days I have ever experienced. Days I later recognized as my Father speaking to me, which made me feel special. It started one afternoon as I was getting pampered with my usual manicure. A man who looked to be Middle Eastern walked into the salon with such a presence that threw everyone there off. He walked directly to me. He asked to read my palm. I politely declined. I never took part in anything like that, although I have always been curious about those that could do such a thing. He said, “You have people whom you love so much, three people.” Stunned, I said “Yes, my husband and my two kids.” He asked again to read my palm. I smiled and said “No, thank you.” His next words started a chain of “Oh my God.” He said, “You pray now, you will need to pray more, may I read your palm?” Slowly, I shook my head and politely declined again. Everyone in the salon paused. No one said a word. He walked out the door. He never looked back. That was the fall of 2007, the season in which I dreamt of blue ocean water, green grass, clear blue skies, and terracotta caves. I also dreamt of sitting on a crowded pew at church. In this dream I could feel many people around me, but could not make out the faces. Everyone was sitting close on this red church pew. Then I could see the person at the end of the pew stand and go away. Everyone would instantly scoot over moving closer to the end of the pew. I watched person after person stand and go away. Then I was at the end of the pew. So I stood, and someone said to me, “You are not finished yet, you have something to do.” This was said to me over and over until I woke up. I opened my eyes and stared at the ceiling. This was September. I worked at a school with some of the best people—people who would lift you up in spirit and keep you lifted. Bonds were developed that are still strong to this day. That cold November, two of my colleagues asked me what I would like to do different for 2008. I told them I was tired. I was tired of being so sick all the time. One led us in prayer. I prayed to find out what was making me ill. God whispered to me quite often after that prayer. He spoke to me in my dreams, reassuring me of something I was not yet aware of. I have always been the type of person that believed one should rest only when they are old. My home had to be one in which all clothes needed to be washed and folded, floors shiny, bathrooms sparkling, great gourmet meals from scratch daily, all the while making sure that at least twenty-five first graders achieved at the highest academic level. I did this all very well, all the time. I was tired. I rushed to get my household tasks completed so that I could be Mommy—the ‘read several books, complete projects, give baths’ type of mommy. I was tired. I would get up at five in the morning and lie down after midnight. I was really tired. I developed bronchitis, and would often suffer with pneumonia. That was the first sign, unbeknownst to me, that a tumor was developing. I began to feel exhausted. A new year and new resolutions gave me an overwhelming desire to do a detox. I had never done one before. I walked around a health food store and looked at the many varieties. I stopped at the perfect detox. It was a yellow box that contained an all herbal detox. I read the instructions carefully, shopped for more fruit and vegetables, and exercised. This was January 1, 2008 and it had been a really long time since I exercised. I could never make time to exercise, because my spine was carrying some weight that made it difficult. Over the next two weeks, I received lots of compliments on my skin and weight loss. But soon, my armpit started to ache and swell. I researched the pain and symptoms, and admitted I needed to see a doctor. I went to a doctor on Super Tuesday in February, 2008 and was told I had a breast infection. I was not relieved in my spirit, but took my antibiotic anyway. The pain in my armpit never subsided after ten days on medication. I called for a different doctor. I went in on Monday, March 3, 2008. The doctor examined me and asked if she could do an ultrasound and a biopsy. I was nervous. Then she started to play music by Seal and asked me if I had kids. Tears rolled down my face. My spirit told me she knew something was wrong. I was diagnosed with stage 2 breast cancer on March 7, 2008 at 4:45pm. It was a Friday. The cancer was a rapid and aggressive forming cell. It had spread to my lymph nodes. I was scared. I cried so hard. All I could think of were my eleven year old son and my two year old baby girl. I never knew that fear could live within me and come out with such forces that shook to my soul, but it did. I can still see each day that led up to March 7, 2008 clear as the day. From the moment I was diagnosed, I kept being the Cheryl I had always known. I was still the person who was always moving, and never slowing down to rest my mind and body. When I was told of my cancer, I was in the middle of completing my Master’s degree in Educational Leadership. I was working on an advanced degree because I knew I would need it to open more doors for myself in education. I forgot all about going further professionally that Friday in March. All I could do was stare at the black and white photo of my family above my couch, and kneel in prayer to God with a request for strength to make it through chemotherapy. I did not know that the strength needed would come from my changing way of living. I did not know that I needed to show weakness to my family to heal. I hid the fingernails I lost, and the toenails that came off because of the medicine. I lied about how well I felt daily, and got up to go teach other kids. I hid everything but my bald head. I never realized that I had permission to take care of myself with no apologies for not being able to wear my super cape sometimes. I continued to work and take my kids to extra activities and throw parties and travel, only I did all of this with blurred vision caused by the medicine. I did not want my husband and my kids to see me sick, yet I was incredibly ill and in the greatest pain I have ever had. I thought crying mournful tears in the shower would be enough to heal. My baby girl was only two years old and my son was eleven. I refused to leave them, and begged God all day, every day, to please let me be their mama. After my diagnosis, I felt like I was caught in a funnel. Life twisted and turned in ways I could never imagine. I had moments in 2008 that made me pause to think about life so much more than I had ever experienced ever. I went through several rounds of chemotherapy, followed by surgery. I was on the edge of having the first Master’s degree in my family. All I could think about was submitting my thesis in the hospital after my surgery, and having my teacher reject it. She asked me to think of how I was behaving. I had just had surgery earlier that day, and I was emailing her about my thesis by that evening. She fussed at me. She should have. Dr. T. allowed me to submit a ninety-one page thesis the next week, and I graduated from Cambridge College with a Master of Science in Education. My degree was confirmed exactly one month after my breast surgery in August, 2008. I marched in the following year, and felt amazing! I decided to start a regular exercise regime and was looking pretty good physically. On the inside, I still felt exhausted. Dr. T’s lecture to me went in one ear and out of the other. In 2008, I left the only elementary school I loved and left some great people to go teach at the school I went to as a kid. I was so excited to be in a community I remembered so fondly, and wanted to do so much to show gratitude for the happiness this school gave me. The principal never knew of all I had gone through. I applied for this teaching position exactly one week after my diagnosis. I started my new school in August, 2008 wearing scarves and wigs. Then came time for my radiation treatments to start, and time to tell some truths. My principal sympathized and prayed for me. I worked long hours and went to radiation after work. I became very weak, and one day I had to tell my new principal that I had to take some time off. She understood, as she needed my support for her recent diagnosis of colon cancer. Over the next couple of years, I worked hard to be this awesome teacher and mom and wife. I went to the doctors a lot. I was poked and prodded so much. I was so tired of it all. My sweet kids would greet me whenever I arrived home from the doctors and hold me so tightly. Those were the only moments I would stop to rest and breathe. God continued to whisper to me. I did not listen to His whispers. God decided to make sure I heard what He said to me. In 2009, our school system was caught in a terrible scandal that stayed in the news for three years. Each year, student enrollment decreased. Morale was getting low, and no one was certain of the future of the school. I had so many responsibilities placed upon me at this school, that it kept me working until 8:30 at night. I had put away all thoughts of healing, and replaced them with stress. My children were getting sad, my son incredibly depressed. My husband and I seemed to argue often. The soul of my home was hurt and I felt responsible. 2012 started with a new resolution—to live life! I planned a birthday party for myself, and when April 8th came, I danced the night away! I was so ever grateful to drink champagne and hug my friends, because four years ago, I was afraid I may not make it to see my 40th birthday. Our school never recovered from the effects of the scandal. The community was really disappointed in my beloved school and wanted it to close. One week after my birthday party, our staff received notice from Human Resources that we needed to reapply for a teaching position. We all were devastated and started to look for work at other schools. One by one, every teacher in the building found another teaching position. I was not so lucky. I had been nominated to be Teacher of the Year by my peers for my teaching ability, yet I was jobless. The stress of not having a job was painful, mentally and physically. This was not what I had in mind when I decided I wanted to live life. But before I could live free, God made me recognize the power of forgiving. This was something I would need to free my soul. I was sad not to have had a job before the school year ended. I contemplated my next move professionally, and then came that familiar overwhelming feeling to do something I had never done before. Suddenly, I wanted to teach for the summer in Italy. I searched the internet and applied to teach a host family English in the countryside of Florence. I figured I could go on vacation and earn extra money at the same time. Going to Italy would be a dream come true. I received a phone call to interview, and was asked if I was interested in teaching in Abu Dhabi. I said yes, although I was not. I didn’t know much about this place, and sadly had my unfair misconceptions about the Middle East. I passed initial interviews and was asked to interview in person in Arizona. Next was my lesson in forgiveness. My estranged father was hospitalized, and passed away when I landed in Arizona. One week after my dad’s funeral, he came to visit me in my sleep. I could feel his soul. He tried to hug me, but I wouldn’t let him. He just stared at me. I knew what he wanted to say, but he couldn’t do it. He smiled and said to me, “Take care of yourself, okay”. His body ascended and I woke up. My heart hurt with a strange pain, and I cried all day. He made it to Heaven. God forgave him for hurting me. I had to do it, too. I received the job offer, accepted the position to teach English overseas, and stepped out on faith into the unknown. Then another family member, a man who stood in my dad’s shoes from time to time, became ill the next week. I would check on this family member often. As I went to check on him in the hospital, I tried to tell him about my new job. He smiled and said, “You are leaving Georgia.” I said, “Kind of, I am going to teach in the Middle East.” He stopped and looked at me. He gave me his blessings and told me to go for it. I promised him I would continue to check on him while I was away. He passed three weeks later. In November of 2012, I was sent by God to a place I had never heard of before. I started teaching in the United Arab Emirates. I left all I had ever known to go to a place where I knew nothing of the people, language, or food. My lesson to test my faith was to go and be open to the experience, all else would go according to His will, making my soul stir. I did not realize that is what I was doing. I finally began to feel a calm and peace that felt like opening gifts on Christmas morning. In the Middle East, there is a call to prayer that rings throughout the land five times a day. My first morning there, I woke up to the Azhan being called. My heart beat and I began to take deep breaths. I went to the window and closed my eyes to the sound. I did this because the call to prayer means it is time to stop what you are doing and praise God. All I could say at the moment was thank you. That is how I felt at the moment, filled with Thanksgiving. During my time in the Middle East, I observed how nothing came before God, people made family a priority, and resting your body was mandatory. I had to learn to follow the local ideas day after day. Soon, it became a part of me. After many days of teaching, I found myself with time to relax, read, take golf lessons, or do nothing. I felt brand new with cleared senses. I knew I would not go back to the woman I was before. My Father continued to talk to me while I was living in the Middle East. It made me curious to go explore the land where Job and Sheba are buried. I was in the middle of Mesopotamia and the 4,000 years of stories taught to us in church. God’s presence could be felt all over the place. For our spring break vacation, my kids and I were exploring the neighboring Emirate of Fujirah. I love celebrating spring break because it always coincides with celebrating my birthday, April 8th. We arrived on April 7,, 2013, in front of a powerful sand and rainstorm. We had a mountain behind us, and the ocean in front of us. Listening to the storm was powerful. It lulled me to sleep. I woke up the next day and stared at the ceiling. I kept looking up, and then it hit me! I recalled my dream. It was my next assignment, my own after-school program. I wrote down everything I remembered all day long. By the time I finished writing, it was a business plan. As I wrote lesson plans and researched latest trends in after-school programs, I experience a happiness that I don’t feel in the classroom. I open my heart and my arms to my assignment to a most wonderful birthday present I could have ever received, The Village Tutorial and Enrichment Program. My dreams continue, and meditation has come into my life. Being still in total quiet is amazing. I can hear clearly and speak to God from my heart. He hears my desires and brings them to pass. His next whisper taught me to remember patience and preparation as I got ready for something else to do in this world. My dream for an after-school program brought me back home to the States. I recently stepped away from the classroom to devote all of my energy to making my program one of a kind. The joy I get from the activity planning and possibilities to enrich lives give me a happiness I have desired for a really long time. 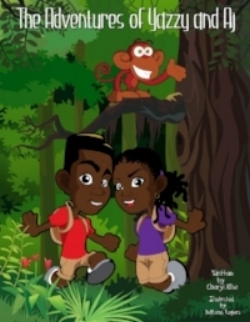 My unwavering faith also evoked an idea that produced a published book written by me, The Adventures of Yazzy and Aj. I get to encourage my love for reading to children of all ages, and write stories with no limits. I have transformed into someone new. I was supposed to change that day after the man approached me. I was supposed to sit still with my diagnosis. I was made to recognize the importance of being obedient to God, forgiving, and His purpose for my life. I heard His whisper of instruction on living free. I now comprehend the answer to my question of why am I here on this earth. I am here to empower children through education. My assignment from God is to enrich children’s lives with opportunities to explore words in literature, grow various plants, develop programs, encourage them to become critical thinkers, and be an example of my life’s lesson of taking great care of self first, so they can be a blessing to others. Gratitude consumes my soul. I am so grateful for the spirit that motivated me to detox to begin my physical and spiritual healing. I have learned herbs are healing, rest is medicine, meditation provides clarity, and practicing them all brings happiness. My belief is what got me through that very hard day in March and the many days that would follow. I am constantly reminded of God’s grace when I wake up in the morning. Stillness and prayer healed me. Keeping pause to talk to God keeps me inspired. I often tell others who have fallen ill to any disease or sickness to rest their bodies. Since I did not pay attention to God when He told me I was ill, He gave me another opportunity to demonstrate to Him my unwavering faith by changing me from superwoman to a remarkable woman. His mercy for me makes me phenomenal. Cheryl & her family in 2015 as she was leaving Abu Dhabi.